†Results vary depending on starting point and effort. 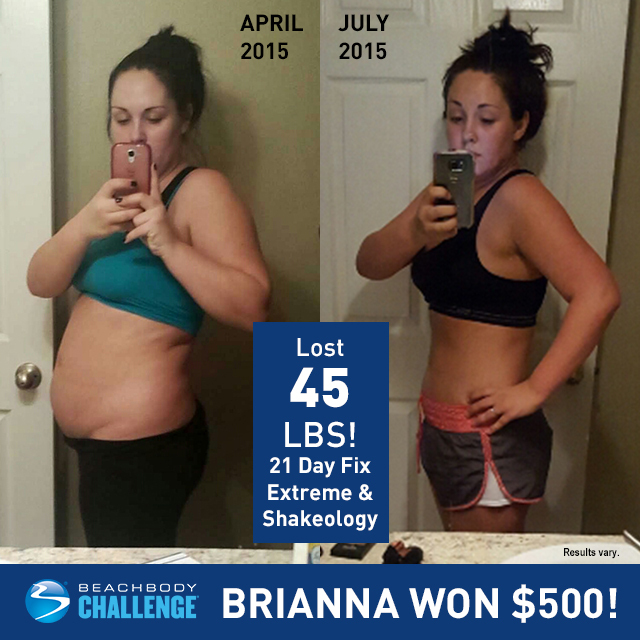 Brianna is an independent Beachbody Coach. Brianna Josephson-Bauld lost 45 lbs. with 21 Day Fix EXTREME and Shakeology. She entered her results into The Beachbody Challenge, and won the $500 Daily Prize for September 3rd! I was six months postpartum after having my first baby.4 I gained 65 pounds during my pregnancy. I was still 60 lbs. heavier than I had been before getting pregnant. I was tired, my self-esteem was lower than it had ever been, and I just felt plain unhealthy! I was so upset that I wasn’t losing the baby weight like people said I was going to. I was almost to a point of no return, I had almost just accepted that this was going to be my post-baby body. I thought I had tried everything. Almost hopeless. This was my last stop before giving up, I wanted to be healthy for myself and my family. I am a recovering addict, I’ve been two and a half years clean, I knew that if I could beat the disease of addiction and recover from something like that, that I definitely could commit to this program for my health. I just had to have dedication and commitment to myself for my future self. I knew it was going to take work just like recovery from addiction does, and I was ready to do something different! I’m so glad I took the leap of faith with my Coach! Definitely fear of failure! I have tried other programs before that just didn’t work for me! I didn’t want to try another program that I would start out strong and then not see results, or have the support I needed! Beachbody helped tremendously by giving me an easy-to-follow plan, quick results to keep me motivated, and 24/7 support from my Coach and through Challenge Groups! I became a Coach too, so that I can help and inspire people the way my Coach and others have helped me! I’m so grateful for the 21 Day Fix EXTREME, Shakeology, and this company in general! Everyone matters, and they/we actually care about us all! I chose the 21 Day Fix EXTREME! I loved it because of the amazing meal plans and portion control containers; the 30-minute workouts were perfect for a busy mom like me. It was easy to follow and gave amazing results! I love that it has completely changed my lifestyle and the way I think about food! I’ve lost 45 lbs. and counting! My energy levels are at an all-time high (even when running on only a few hours of sleep with a teething baby). I’m stronger than ever, I can actually see muscle definition, and it is something that I have made a lifestyle! My confidence level just keeps rising, and I’m back to my happy, healthy self, but even better! I am in a consistently better mood; I’m way more positive. I treat myself and my body like the work of art that it is. I’m able to play with my daughter without getting tired immediately, and I’m being given the chance to help others change their lives too! My quality of life is forever changed. I hope to inspire others with my transformation and I hope to help as many people as possible improve their lives as well! I’m on a mission now, I feel as though I have found my purpose in life. All thanks to Beachbody and my God! It helped so much! It helped keep me accountable and thriving! They pushed me when I didn’t want to push myself! When I didn’t want to get my workout in, I saw other challengers posting about their awesome workout, and it pushed me to get mine in as well! They keep me motivated and feeling like I can conquer any of the roadblocks in my way! She checked in with me regularly, despite being pregnant and about to go into labor! She keeps me motivated and inspired daily! Liz is amazing! She answered any questions I have/had quickly and effectively! I’m blessed to have her on my side!